A profound quote from Ann Voskamp’s blog about the loud, bold posts on social media about abortion. Humble outreach. Exactly. 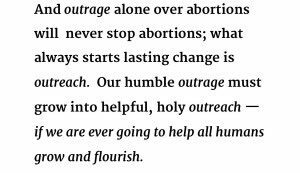 It was the first words I heard about the reaction of many toward Planned Parenthood that really resonated with me. Indignation, graphic videos, and the careless ways people approach the subject…..I don’t believe those change the hearts of women who are considering abortion. I think it further silences them about their unplanned pregnancies, keeps them quiet about their consideration of abortion because clearly the mention of it sends people into a complete meltdown, and certainly shames the women who are struggling with their past decision to have an abortion. The anger is aimed at Planned Parenthood but the message is actually predominantly reaching the women who have had or will have abortions. They are the ones reading the posts and the blogs and the ones hiding further in their self-condemnation. If we handle women’s hearts with gentleness and compassion and they see us as approachable , we can share LIFE with them and maybe one day Planned Parenthood has no abortion clients and there is no more discussion. Period. The love that is shared with the Gospel will be louder than the abortion clinics’ message if we stop shaming and start loving. Does the woman walking into an abortion clinic even know one Christian she could call and seek advice from who might be able to tell her of the options available to her, like adoption? Probably not because all she has seen is anger, disgust, and hatred. So she tells no one and goes through with it alone. Does the 35 year old woman with a child and one on the way dare tell her Bible study that she wonders if her child will be born with defects because surely she will be punished for having an abortion? I doubt it. Everyone has a story and every story matters. What if we stopped talking so loudly and started listening? Sitting with women and hearing their hearts cry out and allowing God to move in the midst…..that is where the movement begins and ends. I spent a few years volunteering at a pregnancy help center and learned so much about mercy and grace from the staff there. I saw compassion and empowering women to choose life……not the approach I see most Christians using recently. Every time we speak in generalizations and harshness, we sound unapproachable and arrogant and we set ourselves apart as someone who would never associate with someone who might be struggling with this decision. So we stand as the SUPERIOR CHRISTIANS and all the while women around us are getting abortions and we will never know. Or women are hiding in our churches, isolated and hurting, and they will never heal because they have to keep it a secret from the SUPERIOR CHRISTIANS. And if you don’t think they are in your pews. check the statistics. And if they aren’t in your pews you probably scared them away before they even made it to the parking lot. What if we loved more and judged less? Stopped screaming and started listening? Stopped posting and started praying? Women need each other and when one thinks her sin is the one inexcusable sin she runs from the Jesus we want her to know. She needs to have a safe place to fall and the world will give her that. Will we do the same, as women who were changed by grace? It never means we must agree with the decision but it does mean that women could come to us, as believers, and we will do life with them no matter what. Let’s show the world that we are saved by a merciful God and because of the extravagant grace shown to us, we have plenty of it to share with others. And let’s be honest about our own brokenness and our own failures. Maybe then we will see women overwhelmed with the love of Christ.